For months, I have been craving their kale tostadas and their bandeja paisa so I knew exactly what I was going to order! Bandeja Paisa is a famous Colombian dish known to really have everything on it: rice, beans, plantains, sausage, pork, beef, eggs, avocado and arepa! I have actually eaten it many times- even in Colombia! Those days of super indulgence and mega meats are gone for me- luckily, since I like my new and improved waistline! 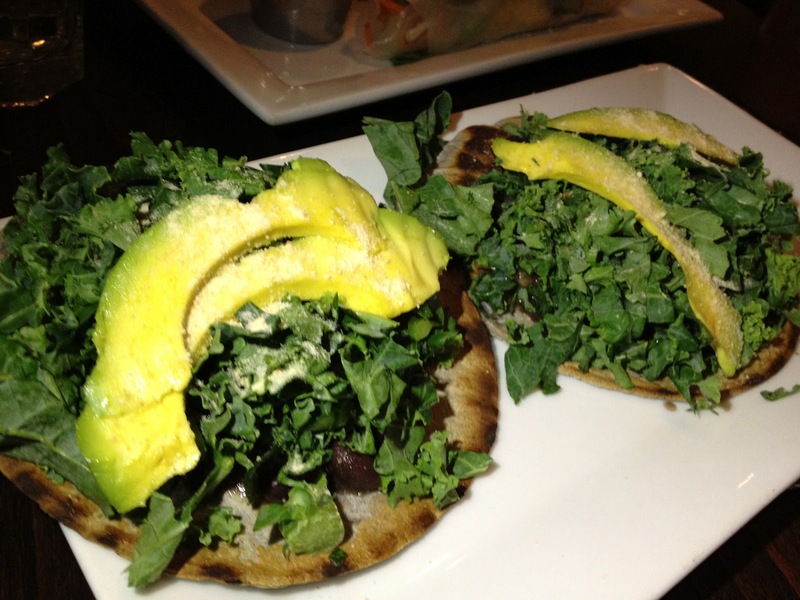 SO.. the kale tostadas were delicious- hands down! I love them and could have even ordered more! The picture doesn’t show the beans or sauce which are under the kale. 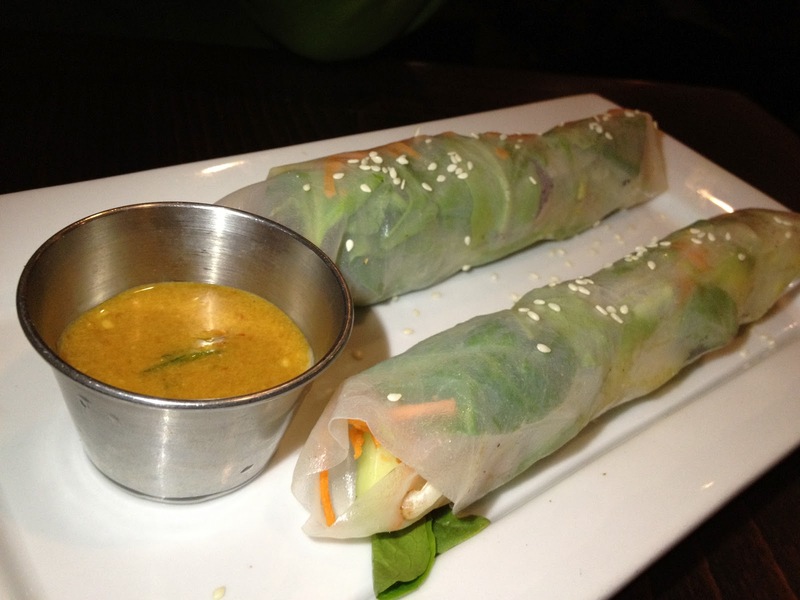 We also ordered the summer roll- another favorite of mine which was simply perfect– light, crisp vegetable taste tightly rolled as one piece with an incredible peanut sauce on the side. My bandeja paisa was pretty good and definitely fulfilling! I remember it a bit different the last time I had eaten there. I think they changed up the “vegan beef”- I am not a fan of the vegan ground beef. I think before it was soy but I’m not sure. 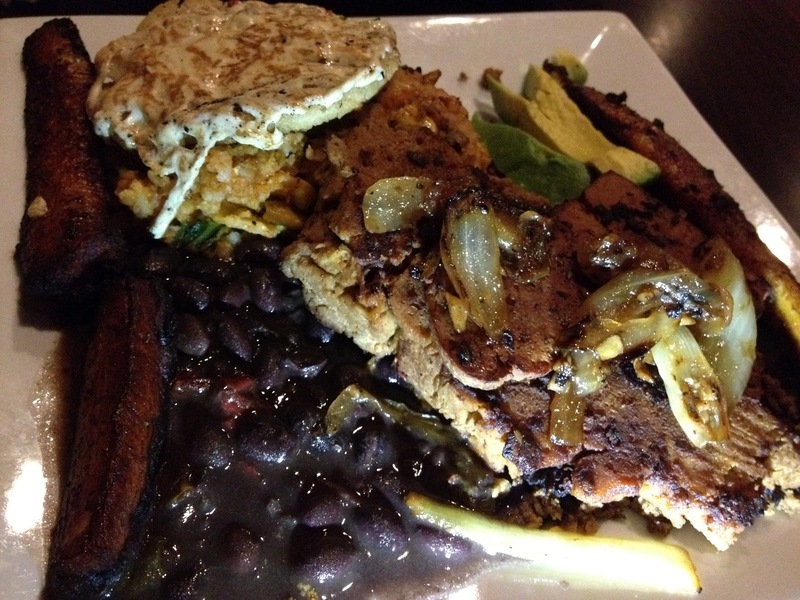 The arepa was delicious as were the rice, beans and other protein “meats”. Honestly, I will have to try it again- it’s been even better in the past. The maduros looked a little overcooked but I guess not because they were really delicious. 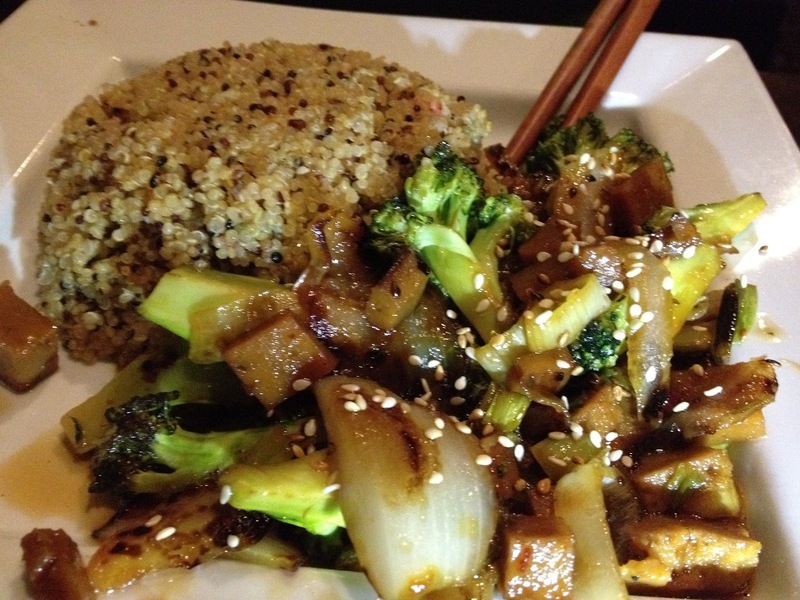 My friend had the seitan quinoa dish which looked good but had a slight burnt taste to it. Quinoa should taste nutty if anything but not burnt. Quinoa cooks fast- if you remember back last month in my blog, I think I burnt it like twice before I got it right- AND I KNOW HOW TO COOK IT– I was just multi-tasking! If you ask me… if you burn something- you have to throw it out. Don’t give me the top part thinking that the burnt flavor didn’t travel up lol. I’m not saying that’s what they did- my friend liked it just fine! I’m just picky I guess but very polite. The seitan part of it was made really well- super delicious! 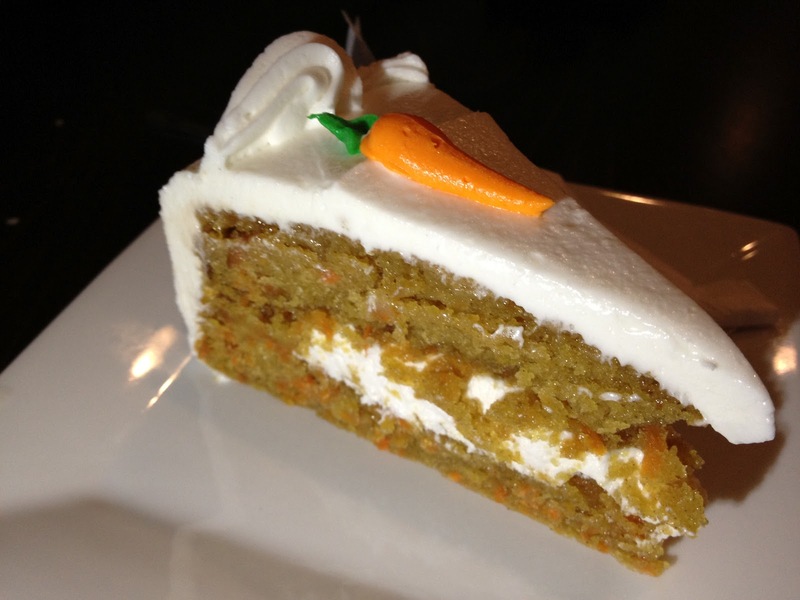 I think I am starting to look like a food critic because they gave us dessert on the house which was the highly recommended carrot cake- and it was delicious for sure! Our waiter was absolutely a sweetheart! While we were finishing up, we saw a few more exciting vegan items come out- french fries and buffalo wings… who says you can’t have fun being vegan! It may not be the healthiest but for sure animals were pardoned and parts of our environment saved! I jokingly wanted to steal the hot sauce- it was that good! They sell their own line of products so maybe the next time that will be available and a cute little V-Spot tee shirt! I love this place no matter what and I will be back again- I wish they would open earlier in the week– I’ll just put that thought out into the universe for now!